Filed to: Functionality ahoy!Filed to: Functionality ahoy! I was talking to a friend earlier, but that is quite enough showing off from me. 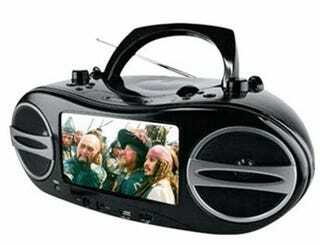 Check out this DVD boom box from Go Video. The device packs in a 7" LCD along with CD and DVD playback capabilities. To wow you even further it has an AM/FM radio too. The features themselves may not be something to shout about, but all compiled into this little package and you have our attention. Who cares if the screen is puny, it is big enough to do the job. (Insert willy joke here. Oh, sorry your willy is too small to qualify). Coupled with the fact you will be able to control your movies and music in stereo sound via the packaged remote and you have a solid little performer. I cannot remember this much functionality all in one device since...since, oh, I really cannot think of a decent multi-functioning gadget, Apple fan-boy that I am. Well, not at $159.99 anyway. [Krunker].